Comments: I won't go into great detail about the performance here except to say this is one of the very best Schubert 9ths, and it has held its ground with the passing of time. I have included some more insightful comments from FFSS below for your reference. Now let's get to the nitty gritty of the vinyl recording. This is an early Decca FFSS from 1958. My first observations upon listening to the recording were: 1) Narrow soundstage. Somewhat disappointing, given that this was recorded in the famed Kingsway Hall. Sitting before my loudspeakers, the orchestra seemed centered in a relatively small area right in the middle of the stage. I would have expected more ambience but instead felt like their was a low hanging ceiling over the orchestra. The soundstage did, however, have the quality of being relatively deep. 2) Nice clarity. 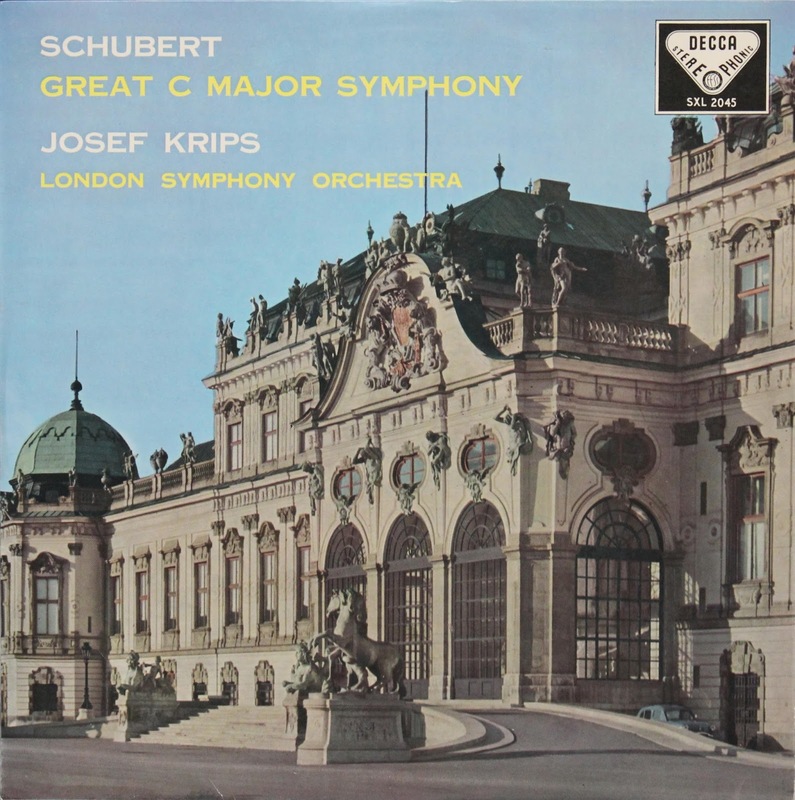 As opposed to the last Krips album, the Tchaikovsky 5th, this album has improved orchestral clarity, most notably in loud and dynamic passages, with just the slightest hint of distortion. 3) Dynamic range felt somewhat compressed, particularly at the upper end. 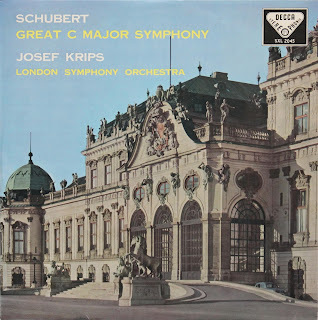 Again, I had Krips' Tchaikovsky in my head still -- perhaps unfairly -- and in comparison, this Schubert album sported just as good low level dynamics but couldn't muster up quite enough sound when the music intensified. 4) Boosted treble. Treble was bright throughout the recording. The digital remaster, one of Decca's limited "The Classic Sound" reissues from the mid-1990s, sounds quite different from the analog. Treble is still a tad bright, but the soundstage is much wider, and dynamic range is not as compressed. Recorded in May, 1958 in Kingsway Hall. Kenneth E. Wilkinson, engineer." Moon and Gray rated this 9 for performance and 9 for sound. I concur with the performance grading but have to disagree on the sound. Maybe a later pressing would resolve some of the problems inherent on this early FFSS pressing. My brief survey of popsike and collectorsfrenzy shows no ED2 or ED3 pressings. I've got London FFSS 1E/!E and it is equally disappointing. The Speakers Corner reissue delivers on the bass as I recall and is definitely better, but not great! I believe the reviewer has quite a selection of EMI Greats that should be reviewed since this vaunted LP has been found sonically lacking. Is this ex 'PX'/USAF stock - as have the same data/$ price tag on some from a UK auction of USAF LP bits'n'bobs many years back. This was re-cut 1967 for Decca Ace of Diamonds (SDD 153: presumbly there was an STS imported from the UK); matrices 3W/3W. Up to around SDD 200 quite a % were from original/early recuts of SXL's. The Schumann 1/4 - Krips you otherwise mention (as an MFP!) - the original 1M/1M matrices were used up to the initial SDD 157 pressings - then quickly recut: 2W/2W. On another note, do you know much of the history of the EMI/Columbia pressings or the Philips UK/Dutch pressings? I've had a lot of questions about how these were pressed, especially those albums which were licensed from the US and then released in Europe, but no one I know seems to have the answers. I guess it requires someone who was present at that time and was in the industry or knew people in the industry. Not sure exactly what you mean re, say, EMI (whose earlier stereo's are 'Blumlein' (crossed pair miked)). Does anyone know (or is it on the 'net) as to when they changed/what type their mastering equipment - or introduced transistors into the recording/mastering chain. EMI did introduce a 'de-esser' mastering circuit around 1968 - designed to limit LP velocities @ high frequencies. 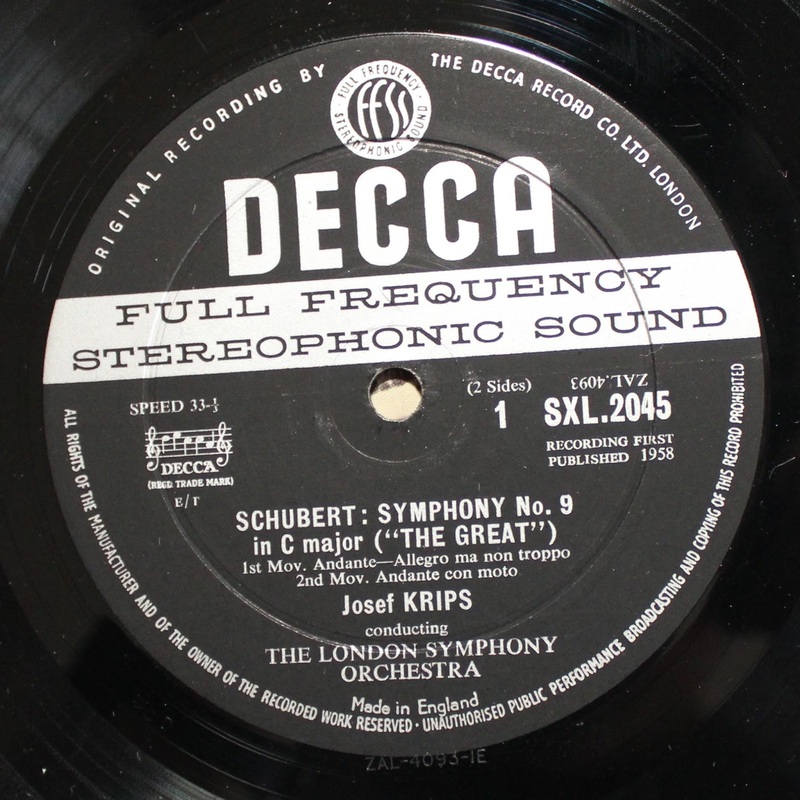 Their earlier stereo discs (<c.1964) were restricted to about 8kHz; in fact, the only EMI I've yet seen 'matching' early Decca (30ips mono) tapes was a 1956 live stereo recording - first issued in the 1974 Gerard Hoffnung box of 3LP's (I did a transfer a few months ago which, even with CD-RW, shows it easily goes to 22kHz). The Philips I guess you are referring to the Bernstein/Ormandy, et al's? They were either mastered in Holland ('670' matrix) - or the UK ('420'). I don't have duplicates to enable me to ascertain if there was a quality-loss (or gain) compared to the MS; not least because US LP's rarely were imported into the UK during the 60's - so (with CBS) only a few US metal matrices were used for pressings. 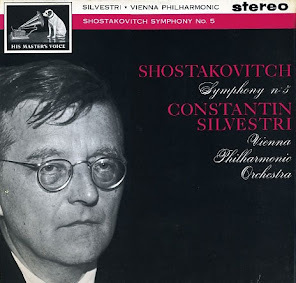 I did notice a severe loss with Prokofiev VC1/2 (Stern) when CBS UK (re)mastered one side compared to my other copy (Philips mastered CBS LP's in the UK until about 1965). 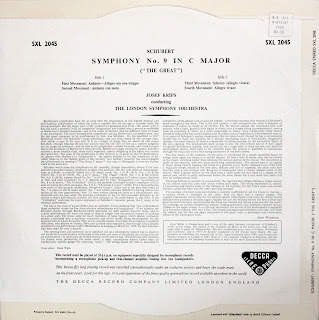 Whatever you do, don't get the Mahler 2/Walter on the Philips label - the UK masterings are horribly distorted on side 4 (even the recut by Philips for CBS label copies aren't good). 1. Were the semi-circle SAX and ASD pressings all transistor? There are some classical dealer websites which indicate that the semi-circle ASD were tube. I've wondered about the semi-circle SAX. 2. Which EMI reissue labels (e.g. Regal, Concert Classics, Classics for Pleasure) were tube vs transistor? I think Meles has some personal insight into this. With regards to Philips, I am becoming more and more interested in this label, since the early Philips which I've sampled (the plum Hi-Fi label) have been mostly excellent. My general observation is that the US Columbia/CBS reissues on the Philips label are not as high in quality as the Philips originals. I've listened to Philips plum-label reissues of Bernstein, Ormandy, and Mitropoulos. In my opinion, they are overpriced on the market. Their MS counterparts are far cheaper, and I would wager that there is no loss in quality. I have yet to listen to a Walter reissue on the Philips label. Again, those seem to have inflated prices on the Ebay/dealer market, perhaps for rarity. His Beethoven 6th, for instance, on the Columbia 6-eye label is a TAS disc, but I don't know if the Philips is comparable. I'd have to listen to find out. Other questions are Oistrakh and Francescatti. Their albums were released on both CBS and Philips, but the Philips are always pricier. 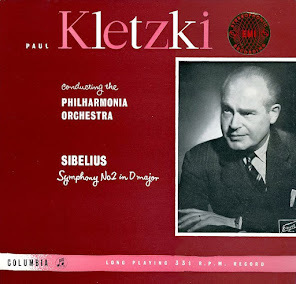 Oistrakh recorded Sibelius' VC with Ormandy. You can get the 6-eye or 2-eye MS for less than $10. The Philips Hi-Fi Stereo always sells for more than $100. Okay, maybe it has an artsier cover, but ???!!??? Does anyone know if it really sounds better? And I mean, objectively? That being said, the Philips original issues (e.g. 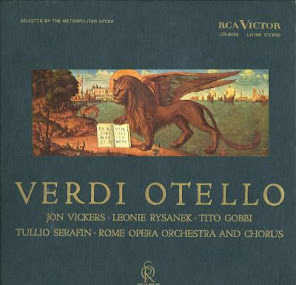 Van Beinum, Haitink, Grumiaux, Szeryng, Markevitch, Davis, etc) are great. I've only heard a hair of distortion on one Haitink album (Dvorak Sym 2), but the others have quiet surfaces, good dynamic range, nice soundstage, and beautiful performances. I can see why these might be of more value, though these usually sell for less than Deccas, EMI ASDs, and Columbia SAX albums. And to think that Mr Salvatore quotes $10 for a simple question!! The EMI changeover (1964?) may be complicated as could still be dealing with 'valve' microphones; but I definitely know there was a change in sound, more likely due to the 'new' mastering equipment around that date (ie, it's minus the 'distortion' you've sometimes been hearing (me too..). The real problem is that collectors/dealers follow 'labels' - not the matrices - so you'll find 'valve' transfers on Regal/Concert Classics (ie also their original SXLP 20000 series - not just reissues from HMV/Columbia). As previously mentioned, CFP rarely used 'old' (pre-1965) matrices - just the odd side (also including Cantelli Beethoven 7; one side from 1958 - though the Regal may have used both original sides?). As mentioned, Philips dramatically improved their transfers late-70's/80s; however, 2 issues that are splendid are the original 1962/3 Monteux/Fistoulari LSO Tchaikovsky: 1/1 for Swan Lake..2/1 for Sleeping Beauty. 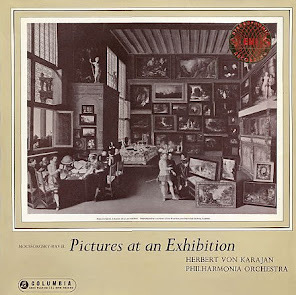 40 years ago I became aware of how poor older, mid/late 60's Philips transfers could be - in a 9LP Handel box issue from about 1972 - which had some from 'old' matrices - which were plain muffled/distorted (as with DGG..only their initial 'LAB' stereos seem OK)- so I would generally steer-clear of Philips/+ their versions of CBS....though I have 'rather a lot'..!! 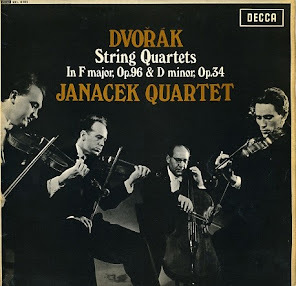 The Dvorak 7/Haitink matrix was also on a 1968 'Festivo' reissue. The late 60's CBS UK mastering of the Francescatti: Bruch is very good - but you can't justify 'trying them out' @ long-range to see if they were worth buying..
Wow! Thank you for all that information! I greatly appreciate your insight. May I ask how you came across all this information? Based on your blog, it sounds like you've been a collector for longer than I've been alive on this planet. Are you based in the UK? What is your take on the Columbia SAXes? Do you think that semi-circles are better/worse/similar to the original blue/silvers? I am still puzzled about what happened when Columbia was licensed to issue the US Epic records on its label. 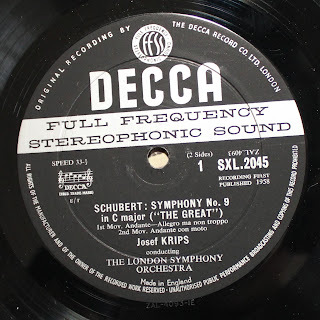 The Szell recordings, for instance, which fetch fortunes on Ebay and from dealers. Some of them sound absolutely no different from their US counterparts, which again, are mere fractions of the price of their UK issues. However, some of them have different A/B sides compared to the US. One of the most expensive SAXes which I have yet to come across is the SAX with Beethoven 7th and Wagner Tannhauser Overture. 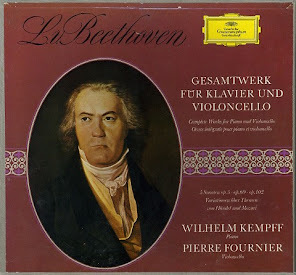 Beethoven's 7th was not released in that pairing in the US, so I suspect that that must have been remastered by the Columbia engineers. My question is whether or not there is a significant improvement in sound there. Thank you for not charging $10 per question. As you can see, this whole blog is public domain, since we intended for all these discussions to be readable by all who are interested. TBH; it's mostly 'an inquiring mind'. "The possibility is that after the Teldec (1958) cutting head -utilised @half-speed, Decca may have used the Neumann SX45 cutter - introduced in 1962 - which extended to 10KHz. The Teldec had an 8Khz resonance/frequency range - hence the half-speed 'cutting'. were subsequently introduced - the model # is year applicable. Decca probably also used Neumann Lathes from c. 1963 - together with the SX45 cutter"
And an ex-engineeer @ Decca mentioned their (early) Digital recording LP's were transferred onto Analog tape for subsequent mastering to LP.. The Semi-Circle SAX ('labels' again..) will/can contain older masterings - but the vinyl formulation changed from 1966 - into something like 45rpm 'styrene'..and only became 'softer' again round about 1973/4 (Decca's changed in 1975, or so). 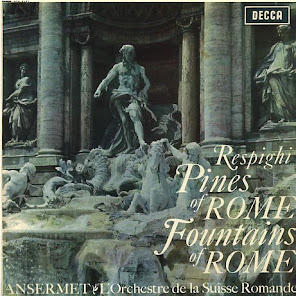 The Szell's (as I think you've noted - read a few months back) contain Columbia N.Y metalwork - I think only a few are EMI mastered (from memory the La Mer/Daphnis - have mono/stereo) and can be quite atrocious - ie; the Dvorak 7 + R,Strauss (disposed of that one. )..so wouldn't fancy the Beethoven 7 (or possibly the Quixote: coupled with D.Juan?) compared to the Epic (Quixote also reissued alone as a CBS Classics - bought that whilst @ School - some of those UK CBS are pretty good (you can get the Bruckner 3/Szell in that series from around 1969). But these (and all LP's you mention) are established 'valuable collectibles'; at least since Oriental Locusts started buying them up as 'assets' in the mid-80's - until then a top-whack dealer price would range from (current $/£) $5 to $25 - the latter being Martzy... $13 would be Kogan/SAX...basically what they are [now] worth, IMO..
That's an interesting observation about the sticker. I actually bought the record about 10 years ago from a US classical dealer in Chicago. Have you heard the SDD of this? I just purchased 3-4 SDDs, all early in the 100s series with FFRR grooved labels, with the understanding that these were cut using the same stampers as the original SXLs. I just listened to the SDD of the famed Maag Mendelssohn Midsummer Night's Dream this morning. I've never heard the original to make a comparison, but I did like the SDD. Excellent clarity, nice soundstage, pretty decent extended bass, and absolutely no distortion which I've heard on a number of the earliest Deccas. I've got an Ansermet Beethoven 4th coming up, so I can check back once I've listened to that one. The SDD cost me about $20, not cheap but far less than an original SXL of this album. I had the Krips Schumann 1/4 which I sold on Ebay a few months back. I was disappointed. The record had what sounded to me to be a compressed dynamic range and boosted treble. It was nice but I could do without it, preferring the interpretations of George Szell on US Epic or UK Columbia SAX. I wonder if the SDD sounds a little better perhaps? The Maag MSND may have an SXL matrix: don't have an SDD (or retain an SXL)..the Mendelssohn 3 is a recut - as is Mozart Ser.Notturna, etc. 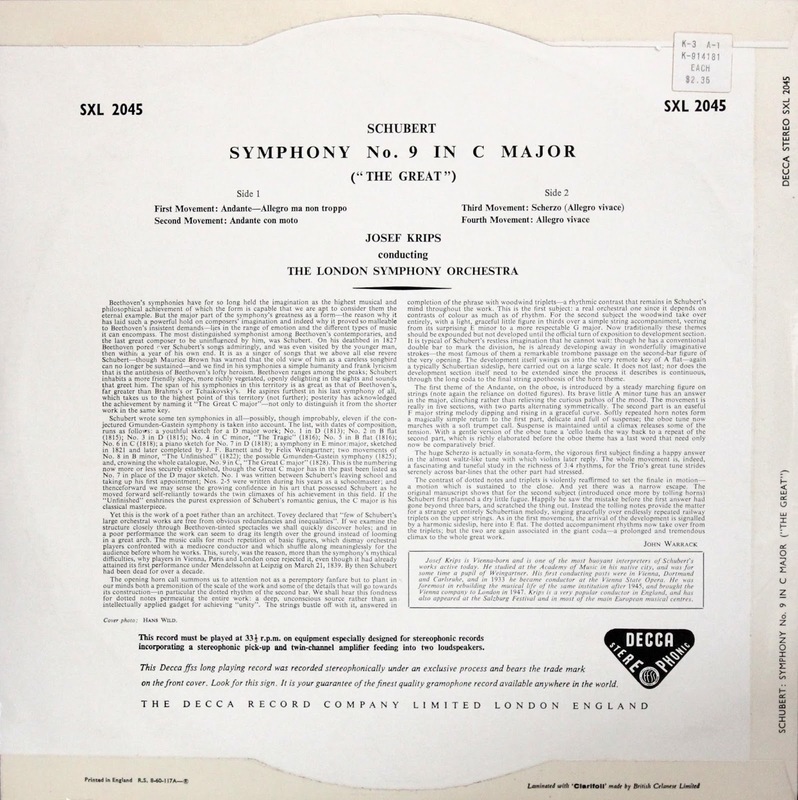 The finest SXL-era SDD orchestral's would include: 136/Ansermet Pulinella/Rosignol 2E/2E (134: Brujo/M.Peter, 1E/1E, not as well recorded/transferred) - 119: Brahms 3/Kubelik 4E/1E (better than Sym 2) - 111: Peer Gynt 8E/3E (better than original CS/SXL.). You need to specify 'non-G' (or W, sometimes 'L') matrices if you require SXL's in SDD format - but there's no need to get them all from the UK as they will likely be on '60's STS (unless you believe 'the label color' will degrade the sound. ;~))..
...but many were recuts from the outset (Boutique Fantasque/Scheherazade/S.Fantastique/Tchaikovsy 6) and sound fine (or 'better'). The Maag MSND does have an SXL matrix ... I don't have it here with me but it is a ZAL xxxxxx xE. Hopefully it is a close approximation of the original! I'm glad you told me about the Mendelssohn 3, since I almost went for it. Question ... when you say it is a recut, you mean that they made new stampers to press these? Why would those be inferior to the older stampers? I will look for some of those SDDs you mentioned. I did own the Peer Gynt SXL but sold it, because I liked it but wasn't crazy about it. If the SDD is better, I'd go for that one. I am waiting on the SDD of the Krips Tchaikovsky 5 which I reviewed here. My hope is that it will sound better and be devoid of that distortion which plagues a good part of the record. Yes, shipping from the UK always complicates things. Meles, my co-blogger, and I have been trying to bulk purchase so that we can combine shipping, but it's always discouraging to see your shipping bill higher than the cost of your records. I have seen and picked up STSs over the years, though most of the ones I see here are not the deep groove ones and probably don't sound as good as the early SDDs. I don't mind the orange, but the SDD label looks nicer. Well, as you've noted (somewhere..the blog layout is a bit confusing - especially as Post 'page breaks' aren't used for 'secondary' info/pics) - the earliest transfers aren't always the best; so Decca had some reason to recut (though the SDD Ansermet 'Enfant' was using original 1D matrices until the late-ish 70's)..so yes, they are recut stampers. BTW the changeover to 'G' (etc) came about, approx, with Maazel Sibelius Sym.1 - the Kertesz Hary Janos had only 1 side as an 'E'. I'd always assumed this denoted some new mastering equipment (ie: no longer being 'half-speed'/Teldec cutters) - but there are claims that method was used until end-60's. Take your pick...but if they changed-over in 1964-ish it would have a bearing on the transfer capabilities. The original Tchaikovsky 5 1959 SXL is 2D/2E - so is my 'sample sticker' SDD from early 1966 - my grooved mid-1966 STS is *3D*/2E - so maybe it got a late'60's G/W recut - and you don't end-up with the same matrices?! Sorry for any inconvenience in the blog layout. We're still experimenting with some changes here and there, but you should be able to search for content using our search gadget. When you say "G", are you referring to the letter after the number in the matrix number (e.g. 2D/2E or 2G/2G)? I am pretty sure that those letters refer to the mastering engineer. G denoted Ted Burkett, and his masterings are reportedly some of the best. This Decca SXL is a USA Military Post Exchange item, as it was sold to a USA Soldier, Sailor, or Marine in Europe. Tin Ear is correct on this one. Funny thing about most of my US marketed UK London pressings, most every one I have has W mastering. I seem to find little else in nice condition around my area.